It might come to you as a surprise but luxurious Ferrari cars have nothing to do with the town of Ferrara. Ferrari cars are actually made in another Italian town: Maranello. Unlike some other cities (Florence I’m talking about you! 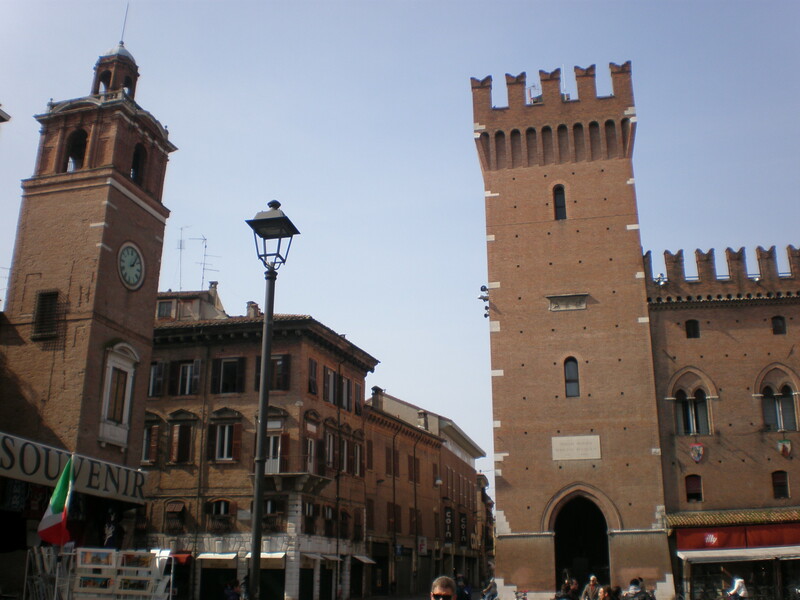 ), Ferrara is still a peaceful town undisturbed by hordes of tourists. There’s a lunch break for a lot of shops and bars and restaurants which means that if you want to buy something, at let’s say 2 pm, tough luck, the shop will be closed! Italians need their lunch (and afternoon nap!) more than your money. Where is Ferrara? It’s in the region Emilia-Romagna, some 50 km from Bologna. It’s also 150 km from Florence and 111 km from Venice, if you’re contemplating a day trip. Ferrara is famous for its Renaissance town planning which has earned it a place on UNESCO World Heritage List. What can you see in Ferrara? Castello Estense: This red brick castle dates from the 14th century and it was once an opulent residence of the noble Este family. It’s right in the center of Ferrara and you can walk freely into it, but if you want to explore its rooms you have to pay an entrance fee. The tourist office, as well as public toilets, are in the castle’s courtyard. San Giorgio cathedral: It’s Romanesque front is breathtaking but if you go around the corner you’ll see that the rest of the cathedral doesn’t have the marble finish. The lower part of the cathedral’s front was completed in 1135 while the rest was finished in the subsequent centuries. I couldn’t go inside to see the baroque interior because it was closed. St.George isn’t just the patron saint of England; he’s the patron saint of Ferrara too. 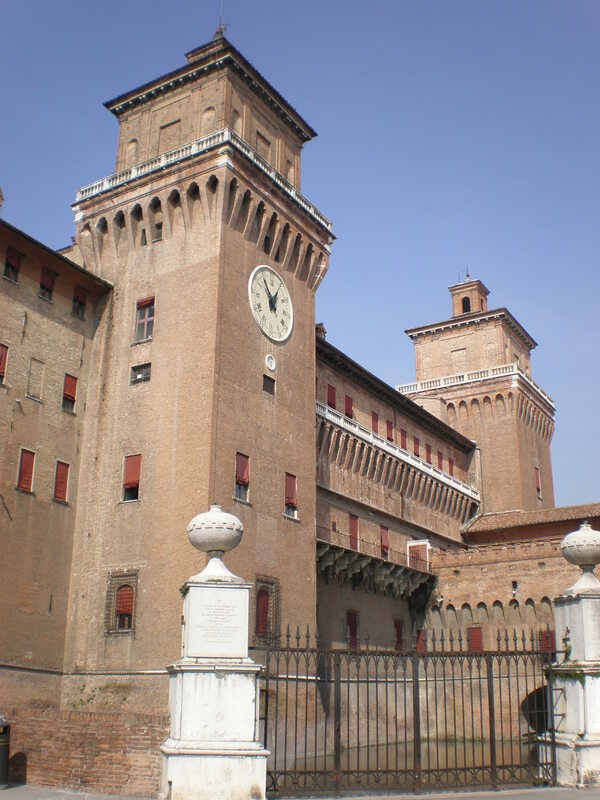 Renaissance palaces: They say that Ferrara is the city with the highest number of palaces. 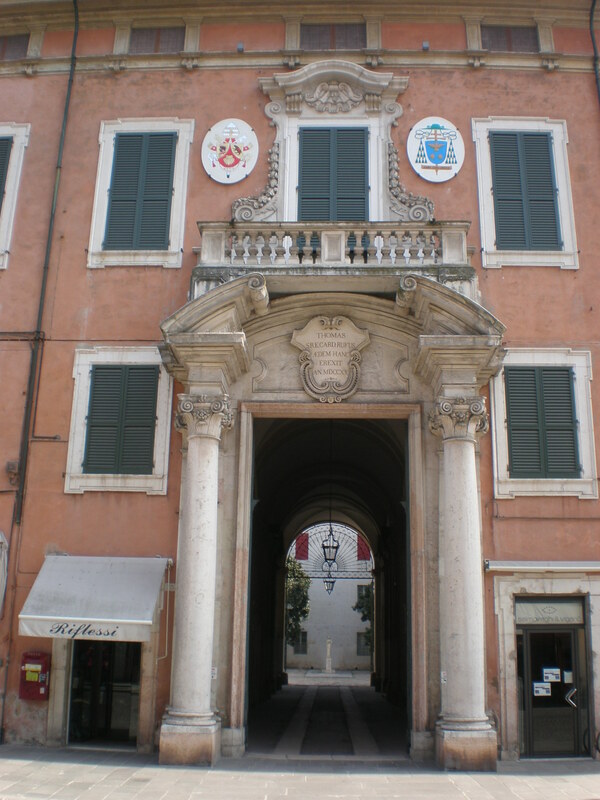 They aren’t that big really, they’re just aristocratic houses built in the late 15th and early 16th century. Probably the best example of them is the Palazzo dei Diamanti which houses the National Picture Gallery. City walls: You can see ancient city walls dating from the 15th and 16th century. These 9 km long walls are among the best preserved Renaissance walls in Italy. The Jewish quarter : If you wander off from the cathedral square and enter one of the side streets you’ll probably end up in the former Jewish quarter. 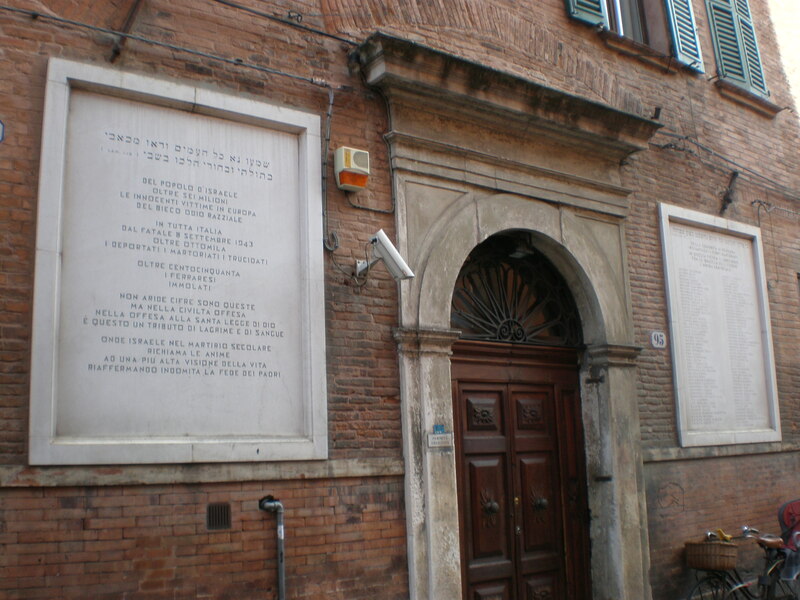 Ferrara Synagogue and the Jewish Museum are located in the historic building at 95 Via Mazzini. Dark narrow streets with arches feature heavily in this medieval part of Ferrara. 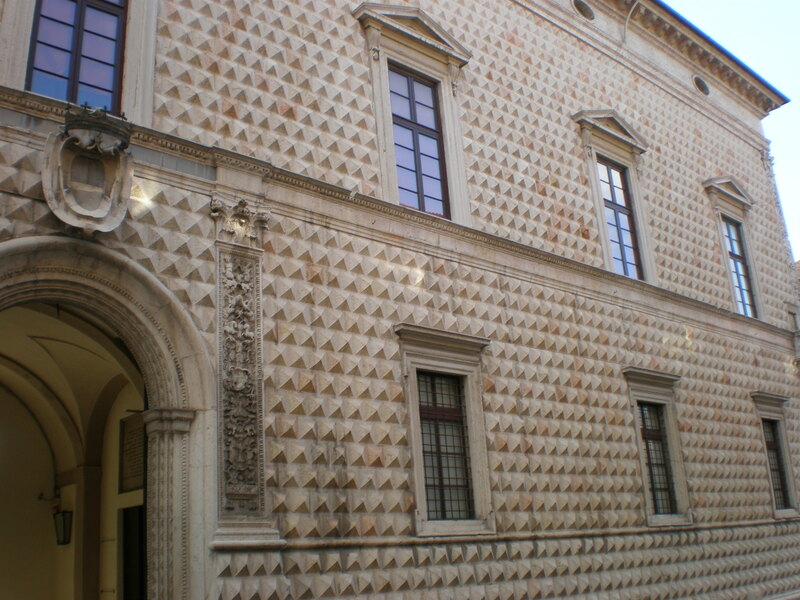 University of Ferrara: Its library has a part of the manuscript of the Orlando furioso and letters by Tasso (an Italian poet from 16th century). The most famous graduates of Ferrara university are Nicolaus Copernicus and Paracelsus. Other sights: You’ll find all of the above sights almost next to each other. 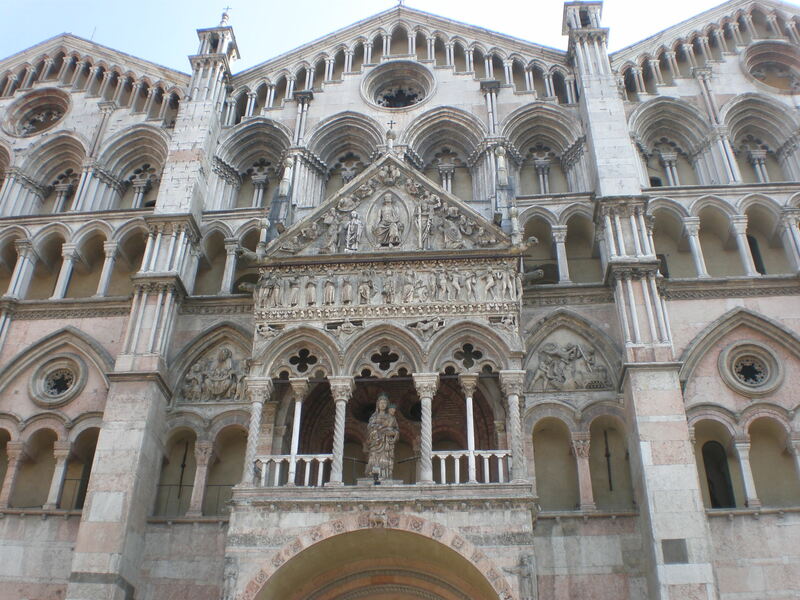 There are a couple of other notable churches, palaces and museums in Ferrara but the ones I mentioned are the most important landmarks in Ferrara. 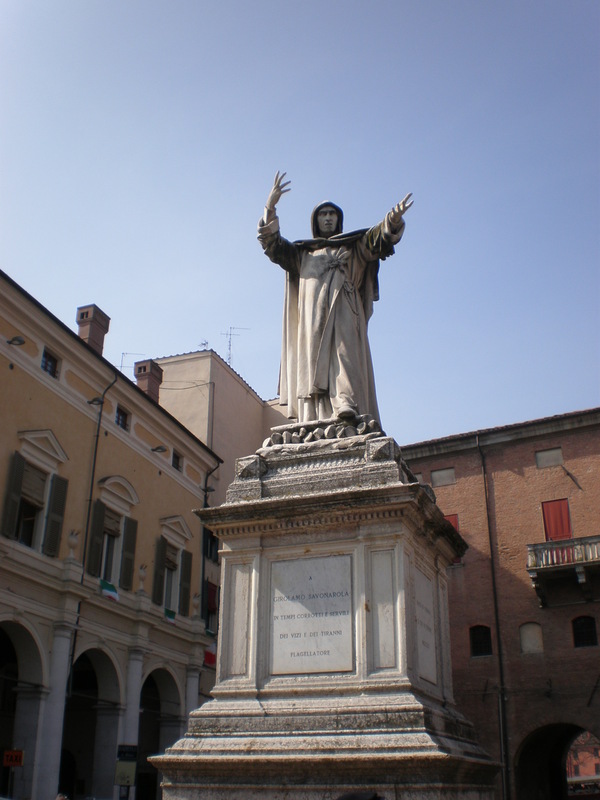 Ferrara was a renaissance center much like Florence, but unlike Florence, Ferrara was also known for its music not just its illustrious literature figures (Torquato Tasso, Ludovico Ariosto and Matteo Maria Boiardo). 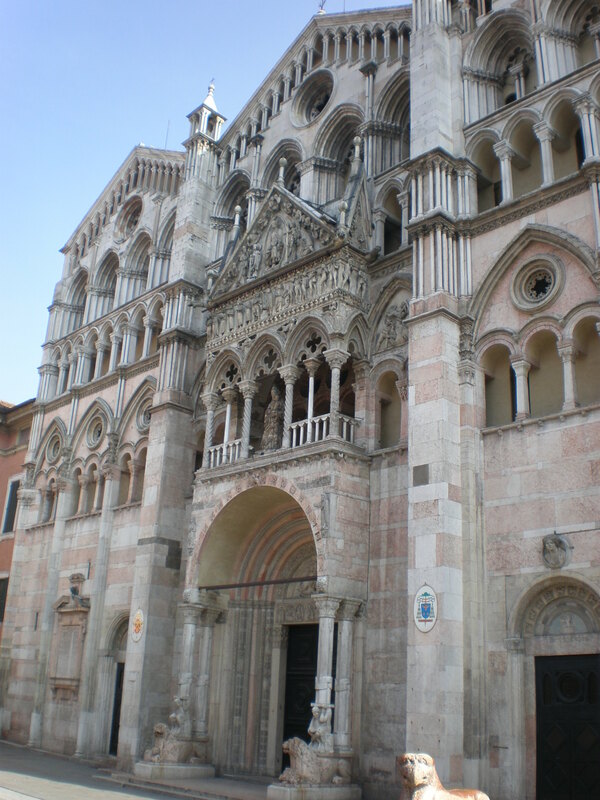 My personal experience: I first visited Ferrara on a summer course. It took me by surprise. I found it to be beautiful but somehow understated and very quiet (it was summer, a lot of people left the city to go on beach holidays). I prefer Bologna, to be honest, but Ferrara has a lot to offer and it can also be a good base for exploring the entire foodie region of Emilia-Romagna. I think that 2 days are enough to see everything in the city. I re-visited Ferrara in the past few years on my way to Tuscany. It’s enjoyable to spend a few hours walking around this lovely town. Actually, Ferrara has alot to do with Ferrari cars… It was in Ferrara that Ferrari gained most of the financing to start his ‘Scuderia Ferrari’ using borrowed Alfa cars in 1929 from Alfredo and Augusto Caniato. The Scuderia separated more from Alfa in 1939 as Auto Avio Costruzionilti with the first true Ferrari car being built in 1947.
yes, I read about your Ferrari visit:) thanks! It looks like a beautiful town! I feel quite smug that it hadn’t occurred to me that Ferrara had a connection to Ferarri, but that is mainly because I hadn’t really heard of the place before. Always interesting to find out about new places. What kind of course were you there for (she says nosily)? It was years and years ago at uni, it was more fun than learning:) But I’ve been back to Ferrara again:) thanks for reading! Beautiful town! I like towns that are not taken by tourist hordes. Thanks for clarifying Ferrari are not from this town. I have heard people saying they want to visit because they have heard the streets are lined with Ferraris. Anyway, I wish I had seen this post a month ago when we were in the region. The castle and cathedral look very impressive. We went to nearby Bologna which was awesome but also considered Ferrara…but in the end ran out of time. So many places to visit in the area. I must admit that I hadn’t heard of Ferrara but I love the look of San Giorgio cathedral. Have a great weekend! I haven’t been, but I’d love to visit Ferrara, as well as every inch of Italy! I have only been twice; actually, I’d like to live there! 🙂 great! Hope you visit it! Beautiful architecture! The cars were named after their maker – Enzo Ferrari.